The Fujifilm X-T10 is a fantastic enthusiast level ILC. Sporting the 16-Megapixel X-Trans imaging sensor, EXR Processor II, Full 1080p HD video and total shooting control on the camera make it lots of fun to use. Performance and image quality will not let you down either. Read more in our Full Conclusion. 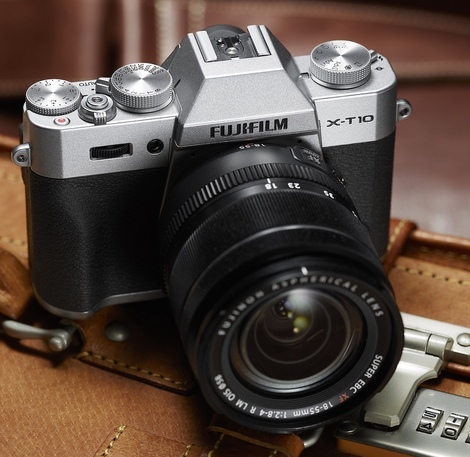 Fujifilm's latest ILC for 2015 has been christened the X-T10. With a 16.3-megapixel APS-C X-Trans CMOS II image sensor, EXR Processor II, and 77-point AutoFocus System capable of 8fps High Speed Burst shooting and Full 1080p HD video capture at up 60 fps, the X-T10 seems ready to take on (and best) many entry-level DSLRs. Diving into the advanced AF system... New Zone and Wide/Tracking modes have been added to compliment that already-proficient single-point AutoFocus. Zone mode offers users the choices of a 3x3, 3x5 or 5x5 focal zones within the 77 AF points, which are enhanced by phase detection pixels in the 3x3 and 3x5 center zones as well as the optional AF-C, or AutoFocus Continuous, which tracks objects. Similarly, Wide/Tracking mode tracks moving subjects horizontally, vertically, and back n' forth through the entire 77-point AF area. The X-T10's native ISO range is ISO200 - 6400, but can be extended to ISO100 - 51200. Fujifilm claims a noise-free image at 51200 with strong black levels, but we'll have to see when we test it ourselves. It's possible, giving the larger APS-C image sensor, but our experience says to expect some noise. Full HD Video is a must for ILC cameras, but it's nice to be able to select multiple frame rates, including 24, 25, 30, 50 and 60fps. This helps out not only in matching cinematic as well as US and international TV frame rates, but also gives you the option to do in-camera slow motion video. For those nostalgic about shooting on film, the X-T10 offers 11 Film Simulation Modes, including Classic Chrome (Mama, don't take my KodaChrome away! ), as well as 8 Advanced Filter Functions to allow your creative spirit to capture an image anyway you see fit. Lastly, the Fujifilm X-T10 boasts built-in Wi-FI. When paired with a iOS or Android smartphone running the free FUJIFILM Camera Remote app, you can use your smartphone as a remote control as well as back up and share images via your phone or tablet. Also, using the free INSTAX Share app, you can send your photos directly to a compatible INSTAX Share Printer. See our best price box at the top right of this page to see current online pricing.